Popular diet advice likes to talk about what foods you should avoid. Don’t eat a lot of carbs. Get rid of gluten. Cut out all fats… And the list goes on. Sometimes knowing what not to eat can be helpful, but what you should really pay attention to is what your diet should include; the essential nutrients and minerals it needs to function optimally. 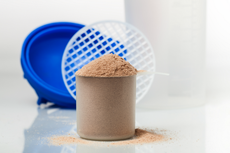 Click here to see the facts you need to know about protein. One of those essential nutrients is protein. Proteins make up every part of your body from your skin and hair to your blood and muscles. Without protein you couldn’t live. If you eat a varied diet, chances are that you’re already eating enough protein to meet your body’s needs. The CDC says that not eating enough protein is a rare occurrence for an adult in the United States. However, there’s also a chance you could improve your overall health and fitness levels by being more strategic about your protein intake. Aside from its role as a nutrient essential to life, when implemented strategically into a balanced diet (and a lifestyle that includes regular exercise), protein boasts a hefty list of health benefits, including the ability to aid weight loss. But before you start replacing all of your meals with protein shakes, there are a few things you need to know; like how to determine the right amount of protein to include in your daily diet, what the best sources of protein are and even how you can help your body absorb it best. I talked with two fitness and nutrition experts to find out the facts. Marc Perry is the founder and CEO of BuiltLean and a top personal trainer and fitness expert in New York City. Aimee Nicotera is a Florida-based personal trainer who holds a B.S. in Nutrition Science and a Master’s Degree in Health Education. Both weighed in on everything you need to know about protein and also helped shed light on some common misconceptions about it along the way. Whether you’re working on losing weight, building muscle mass or improving your overall diet, protein will play an important role in your success and these are the things you need to know about it.